In the run-up to their collaborative installation Interfaces - set to be revealed during Milan Design Week in April 2019 - Dassault Systèmes and Morphosis discuss the interplay between science, art and design and the role of data and design thinking when applied to real-world issues facing urban environments today and in the future. During Milan Design Week 2019, Dassault Systèmes returns to the exhibition space Superstudio Più. This is the leading 3D design software company’s latest collaboration with influential members of the design community, to reinforce its mission to create a more sustainable, resilient and regenerative world through design. Dassault Systèmes’ event “Design in the Age of Experience” examines how pioneering innovations can drive change in our cities, mobility networks, energy use, and daily endeavors to reduce humankind’s damaging impact on our planet. Visitors are encouraged to experience solutions provided by Dassault Systèmes’ 3DEXPERIENCE platform through a varied program of activities throughout the week. Following the success of the 2018 collaboration with global thought leaders Kengo Kuma, Daan Roosegaarde, Wesley Goatley and Superflux, this year’s Design in the Age of Experience will feature “Inter faces,” an immersive installation created in collaboration with Los Angeles-based architecture practice Morphosis. 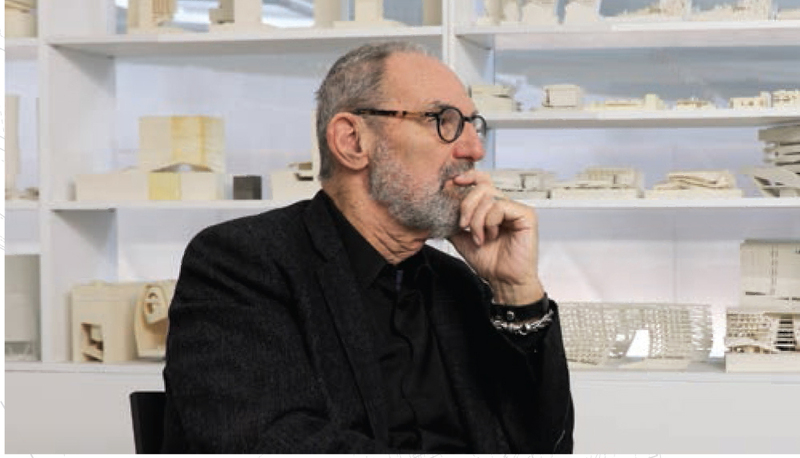 Thom Mayne, Kerenza Harris and Eric Meyer of Morphosis will reveal this interactive experience examining the role of design thinking when applied to real-world issues facing urban environments today and in the future. The exhibition takes as its content real models and data from Morphosis’ projects, designed with Dassault Systèmes’ software solutions. Using augmented reality and digital projection, “Interfaces“ immerses viewers in an interplay of data and decisions embedded in the contemporary design process. Animated rotating panels are transformed into interfaces that connect human experience to contemporary design environments: solar and energy efficiency studies, human experience parameters such as interior climate, material economies, production streams and the building’s relationship to its urban context.